Can Canada Save Europe from Energy Dependency on Russia? | Environmental Europe? But the logic of this argument seems rather strange: Canadian LNG exports will only commence several years hence and once they do, they are unlikely to contribute meaningfully to alleviating Europe’s dependency on Russian gas. For starters, Ukraine has no LNG import terminals and Canada has no export terminals. 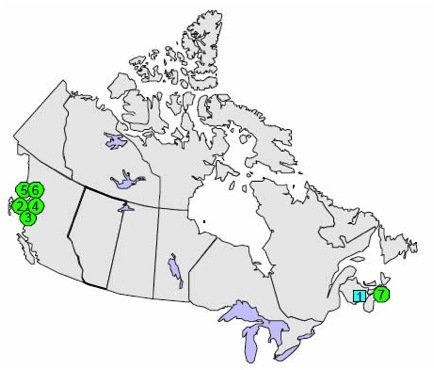 Of the 16 planned terminals in Canada, only three will be on the East Coast. Germany receives approximately one quarter of its natural gas as LNG from Norway but building new terminals takes at last 2-3 years. And because Japan pays much more for natural gas than Europe, North American LNG exports are more likely to go to Japan than to Europe and therefore at best indirectly affect Russian natural gas exports to the EU. Why, then, are Canadian politicians so actively promoting LNG to Europe? The Politics of LNG in Canada: A New Approach to Oil Sands Diplomacy? As Canada aspires to become “an emerging energy superpower”, finding new markets and new investors has become a leading priority. Consequently, the Canadian government formed a Pan-European Oil Sands Team to lobby the EU, millions were spent on advertising campaigns in the U.S. and Canada and Prime Minister Harper cited “exceptional circumstances” to allow state-owned firms to invest tens of billions in tar sands development. This change in Canadian foreign policy, which one prominent Canadian commentator described as a shift from “statesmanship to salesmanship”, has been less than wildly successful however. Proposals to build pipelines east and west from the tar sands, which are located almost exclusively in the landlocked central Canadian province Alberta, have been met with protests, native land claims and environmental activism. In the U.S., protests in dozens of major cities have held up the now infamous Keystone Pipeline for 5.5 years. Concomitantly, the European Union passed the Fuel Quality Directive (FQD) in 2009, which aims to reduce the greenhouse gas (GHG) intensity of all transport fuels by 6% between 2010 and 2020. But in 2011, the EU decided to review the FQD and proposed that tar sands crude was to receive a greenhouse gas rating 22% higher than conventional oil reflecting the emissions required to turn bitumen – the tar-like substance that forms the tar sands – into oil. While Canadian officials contest the methods used to measure lifecycle GHG emissions from different oil sources, environmental groups have emphasized that high emissions fuel sources could derail EU emissions targets. However, to date, the EU has not been able to agree on this implementing measure. Interestingly, Canada exports very little energy to Europe. In fact, Canada exports a little more than 1% of its oil to non-US destinations, and the country only shares 0.08% of EU imports. Crucially, Canada sends all of its LNG exports to the U.S.
What concerns Canadian officials, however, is that EU rules could set precedent by assigning certain emissions values to Canadian oil. Although Canadian exports to the EU are unlikely to increase anytime soon, the EU may restrict American exports of refined products containing Canadian oil. While it may have been trade interests as much as lobbying that succeeded in getting the EU to reconsider the FQD, the cost, in both financial and political capital, has been high. According to Oliver Geden, senior research fellow at the German Institute for International and Security Affairs, “many in Brussels were disturbed by the massive scale [of the lobbying].” Additionally, it is unlikely officials in Brussels will have forgotten that Canada was the first state to refuse a second engagement period under the Kyoto Protocol. In this context, the Harper Government, seeks to rebrand itself in Europe and the U.S. The crisis in Crimea and the emergence of Russia’s energy hegemony in Eastern Europe as a major international political issue is a low cost opportunity to gain some goodwill towards Canadian energy. The EU would be wise, however, to recognize that Canadian energy is unlikely to play any significant role in the future. This entry was posted in Current Affairs, Economics & Trade, Energy & Climate Change, Environment, Global & International, Science & Technology and tagged Angela Merkel, Canada, climate change, Crimea, energy policy, EU environmental policy, European Commission, Germany, LNG, Russia, Stephen Harper, Ukraine. Bookmark the permalink. Previous: The European Parliament: An Environmental Champion Now and in the Future? 2 Responses to Can Canada Save Europe from Energy Dependency on Russia? The capacity of all terminals in the world for liquefaction at the end of 2013 was 407bcma and it should reach 545bcma at the end of 2017.